We develop and support innovative online courses, bringing world-class UT faculty and students together through technology. Work within the discipline of a set class time. Lectures are streamed live to your computer, and include class activities, discussions and interviews with experts in the field. Attend class by logging into the class website through Canvas during scheduled class times. Visit the 24/7 test stream to test your computer and network connection before classes start. Work at your own pace with weekly deadlines. Classes include pre-recorded lecture segments, activities, readings, discussions and expert interviews accessed through Canvas and subject to established deadlines, but completed on your own time. 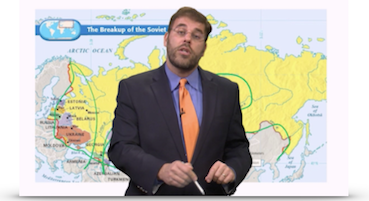 Dr. Jeremi Suri teaches the live online version of Introduction to US History Since 1865. He collaborated with the Development Studio to develop the technology, allowing him to annotate historical maps in real-time. Hundreds of students online participate with Suri as he teaches the maps of our nation's history. 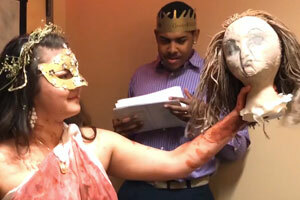 Students in Dr. Steve Lundy's Introduction to Classical Mythology course worked throughout the semester to bring a performance of Euripides' The Bacchae to life online in real-time. They created sets, designed costumes, and rehearsed before the show. This performance allowed students to more fully understand a very complex and often difficult-to-understand play. In Fall of 2017, hundreds of students from the University of Texas logged on to their live online Jazz Appreciation course at class time, just like every other day of the semester. 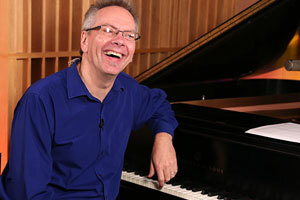 Through interactive tools used in the course, they virtually met members of a seven-piece jazz band, asked questions, and watched performances led by their professor, Dr. Jeff Hellmer.